Li, J., Shao, X., Qin, N. and Li, Y. 2018. Runoff variations at the source of the Yangtze River over the past 639 years based on tree-ring data. Climate Research 75: 131-142. Hardly an extreme weather or climatic event goes by these days without multiple claims that it was caused by CO2-induced global warming. In order to properly vet such claims, the magnitudes and/or frequencies of those events must be examined within the proper framework of historical climate. If it can be shown that there is nothing unusual, unnatural, or unprecedented about a given contemporary climate event, for example, it cannot be concluded that rising concentrations of atmospheric CO2 are having any measurable impact on that climate parameter. Consequently, it is important that scientists develop long-term millennial-scale climate records to understand the full range of natural climate variability. The latest research team to produce such a record is that of Li et al. (2018). Using new and existing tree-ring records from the Yangtze River basin, the four Chinese scientists produced a 639-year record of regional runoff for this key region in China. The ensuing reconstruction is depicted in Figure 1 below. Examination of the annual data revealed, as reported by the authors, that there were "47 dry years and 45 extremely dry years [in the record], which account for 7.36 and 7.04 % of the whole period; moreover, there are 69 wet years and 31 extremely wet years, which account for 10.80 and 4.85 % of the whole period, respectively" (extremely wet/dry years were defined as values more than 1.5 standard deviations above/below the mean, while wet/dry years were defined as values between 1 and 1.5 standard deviations above/below the mean). With respect to decadal variations, Li et al. report the presence of seventeen high flow and fourteen low flow periods where the annual runoff was consistently eleven or more consecutive years above or below a running average eleven-year mean, respectively. 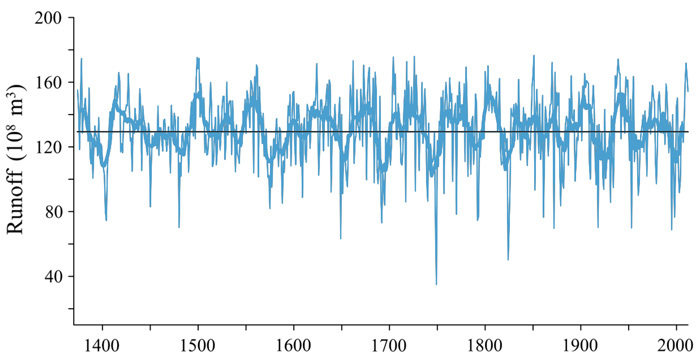 The two longest wet periods, both 29 years of duration, occurred between 1615 and 1643 and 1744 and 1783, while the two longest dry periods persisted from 1445 to 1490 (46 years long) and 1568 to 1594 (27 years long). Li et al. also investigated the record for periodicities, where it was revealed that it contained cycles with periods of 2-5 year and approximate 20 and 50 year frequencies, the latter two of which they opined were most likely related to solar activity that alters the strength of the southwest Asian summer monsoon. Consequently, in light of all of the above, it would appear there is no indication that the 40 percent increase in atmospheric CO2 that has occurred over the past two centuries has had any influence on runoff of the Yangtze River basin. Its modern trends remain well within the range of natural variability and are most likely influenced by solar activity. Figure 1. Reconstructed annual runoff within the source area of the Yangtze River for the period AD 1374-2012. The straight black horizontal line represents the long-term mean, whereas the thin and thick blue lines represent the annual values and 11-year running mean values, respectively. Source: Li et al. (2018).